Peterborough Lions will be looking to build on their spirited showing from a fortnight ago against Preston Grasshoppers when they resume their National League Two North programme away to Macclesfield on Saturday (3pm). Preston eventually went home with a win but they were forced to graft so hard for victory and only clinched it with a try bang on the final whistle. The Lions second team that beat Old Northamptonians seconds. That gave them a 19-12 success after the Lions had led, deservedly so, 12-0 at half-time. On that occasion the Lions, uncharacteristically, came flying out of the traps.They scored two tries early on and proceeded to dominate the first half. They’ll be looking for another fast start on Saturday in the hope of completing the double over a Macclesfield side they beat 14-12 at Bretton back in November. It’s a battle of the basement boys with Lions rock-bottom and Macclesfield second bottom. Both appear doomed. But Macclesfield, a former National League One side, still believe they can survive and are billing Saturday’s match on their website as ‘a do or die game’. 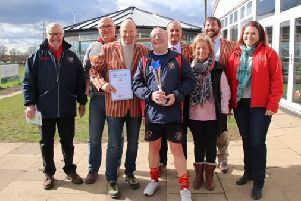 There was a rare outing for Peterborough Lions seconds on Saturday. They were away to Old Northamptonians and won 17-12 through tries by Joe Lee, Franco Perticaro and man-of-the-match Josh Davies plus one conversion by Will Moore. The match was a somewhat feisty affair with Martin Lewis receiving a yellow card in the first half for backchat. Borough and Oundle should return to winning ways in Midlands Division One on Saturday after losing their last league matches - Borough to table-topping Kettering and Oundle to Lutterworth. Both are at home with Oundle entertaining bottom team Melton Mowbray and Borough facing fellow strugglers Leighton Buzzard. Oundle were in cup action last Saturday. 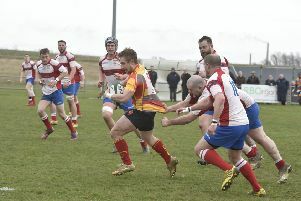 They were at home to Bedford Athletic in the semi-finals of the East Midlands Cup and lost 47-26. Borough will now meet Bedford Athletic in the final at Bedford Blues’ Goldington Road ground at the end of April. Stamford and Bourne were both in Lincolnshire Cup semi-final action on Saturday and there was a huge upset win for Stamford. They were at home to Scunthorpe, who play two levels higher, and they stunned the Midlands Premiership table-toppers 24-17 with tries by Toby Anderson, Joe MacDonald, Rob Smith and Rees Burns. Head coach Matt Albinson hailed the victory as their finest performance of the season. Bourne went 8-0 up against higher level Lincoln in the other semi-final with an Adam Binns try and a Sam Evison penalty but lost 46-8. Borough Ladies were pipped 14-12 at Shelford in their penultimate National Women’s Conference Midlands Division One fixture. After a scoreless first half Shelford went ahead with a converted try. This spurred Borough on and after about 30 phases Nat Elliott was able to burst through the home defence and score a try to make it 7-5. A Shelford breakaway gave them a 14-5 lead before Michelle Bark put Sarah Winder into a gap for a try converted by Zoe Wright with two minutes left. Captain Mel Fulcher chose Bark and Jess Robinson as her forward and back of the match respectively . National League Division Two North: Macclesfield v Peterborough Lions. Midlands Division One (East): Oundle v Melton Mowbray, Peterborough v Leighton Buzzard. Midlands Division Two East (South): Market Bosworth v Huntingdon. Midlands Division Three East (South): Northampton Casuals v Bourne, St Neots v Stamford. Midlands Division Three East (North): Sleaford v Spalding. Midlands Division Four East (South): Northampton BBOB v Deepings, Stamford College Old Boys v Aylestone St James, Thorney v Wellingborough OG. London Division Three Eastern Counties: West Norfolk v Wisbech. Midlands Division Two: Peterborough v Olney.